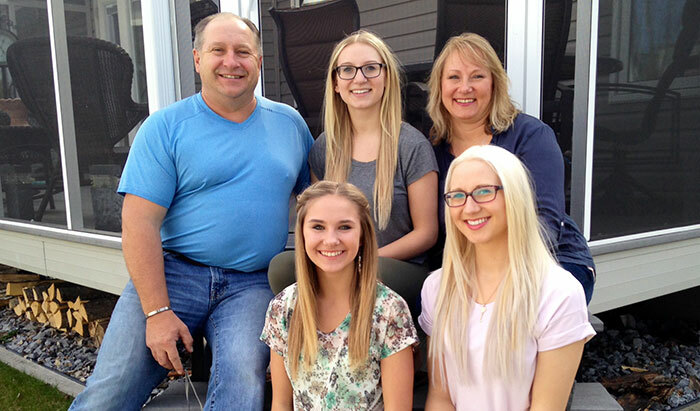 IN THE FAMILY: Clockwise from left, Les, Jayde, Colette, Taylor and Jordyn Hennig have made raising money for the Alberta Cancer Foundation through their family business and other means part of their collective mantra. Charity may be the noblest of human activities, but it’s not always easy to stay motivated. Why would a man in his 50s incur blisters and frozen toes year after year in a marathon charity hockey game? Why would his wife dish out food for hundreds of people at that same game in freezing cold temperatures? 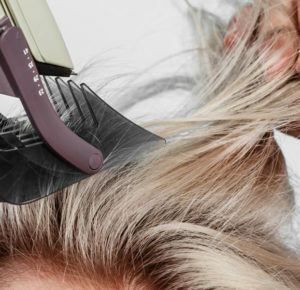 And why would their teenage daughters willingly crop their hair to make wigs for chemotherapy patients? “Dad loved raising funds for all sorts of causes, including the Alberta Cancer Foundation,” says Colette Hennig. The family in question is the Hennigs and, as acquaintances will attest, helping raise funds for cancer research is as natural to them as any family-oriented activity. “It’s never a question of staying motivated because the gratification we get from fundraising is the best reward,” says Colette Hennig, co-owner of the venerable Stawnichy’s Ukrainian food company in Mundare, Alberta. Stawnichy’s and the Hennigs are long-time participants in the World’s Longest Outdoor Hockey Game, an Alberta Cancer Foundation fundraiser which this year eclipsed its $1-million fundraising goal. Funds raised through the game go towards the purchase of a PET-MR scanner at the Cross Cancer Institute, a machine that combines the detail of an MRI with the abilities of a PET scan in order to show exactly where cancer tumours are and how they’re affecting the body. Colette’s activities generated $17,000 this year ($15,000 in 2011), and just as in years past, every penny goes to the Alberta Cancer Foundation. Colette and Leslie’s daughters, Jordyn, 12; Jayde, 16; and Taylor, 21; have gladly shorn their locks to help chemo patients. Most remarkably, Jordyn’s first “Cut for Cancer” event, staged in her school gymnasium when she was seven with local media attending, caused observers to donate $16,074. “My daughters are constantly checking to make sure I’m doing all I can for the cause,” says Colette. “They’re relentless to the point of distraction, but it’s wonderful to see them so committed.” The Hennig family fundraising tally over the years comes to a grand total of $127,674. But how did the Hennigs come to be such ardent charity workers? Colette adds, “He had such enthusiasm for getting involved because to him it was being appreciative of what the community had done for him.” One of Edward’s philanthropic actions was in 2006, when he spent $11,000 at an auction for a pink guitar signed by musicians of the Big Valley Jamboree. “Needless to say, dad’s enthusiasm rubbed off on all of us,” says Colette.